Known for being the home of Arizona State University, Tempe is a booming city full of business, art and recreation. Downtown Tempe and Mill Avenue offer an active nightlife and a beautiful view of Tempe Town Lake while a short drive immerses you in culture with access to historic properties, public art and Tempe History Museum. Transportation is made easy with light rail access as well as bus, bike, pedestrian facilities. 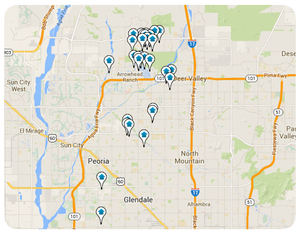 Tempe continues to grow and develop each year while maintaining a neighborly feel.